The central character of George is unlike many protagonists — the child of a single mother, younger sibling to an older brother and a transgender child who has yet to disclose this truth to those around them. George is a fourth-grader who longs to play Charlotte in the school’s production of Charlotte’s Web, rather than Wilbur, the male pig. George’s desire stems from the fact that Charlotte is the role with which she most identifies. George does not see himself as male, so from the very outset of the book the pronouns used describe how George sees herself. George decides to audition for Charlotte with the hope that she can finally be a girl in front of others and in the hope that others will see and realise this is who she is on the inside. George is denied the opportunity to play Charlotte because of their gender, and her best friend gets the part. George figures if she can’t be Charlotte, “She would be Charlotte’s Charlotte, deeply hidden in the shadows” as her stage hand. Together they hatch a plan to show everyone who George really is. 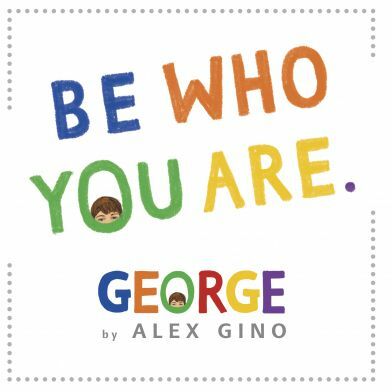 Author Alex Gino wonderfully addresses the struggles of being a transgender young person, revealing how it is an intense struggle to be one person on the outside but feel like someone else on the inside. The book also incorporates broader issues around navigating relationships, including family misunderstandings and acceptance, peer support, bullying and public acceptance. The underlying message to readers is to “Be who you are”, which is beautifully represented in this complex story. This children’s book is inspired by the 2015 documentary Gayby Baby, and tells the story of a kid who loves wrestling, despite the fact that his mums do not. The main character, Gus, loves wrestling and wants to dress up as a wrestler for Mardi Gras. His mums are less enthusiastic about his outfit, and are concerned about the violence of wrestling as well as the images of masculinity portrayed in this industry. The book reflects on images of men, and what it means to be a man, “having big muscles and being macho isn’t the only way to be strong” and follows Gus’s developing ideas about the topic. The story also delves into emotions and changing viewpoints or attitudes. The illustrations of the book, by Tom Jellet, are colourful and depict a family negotiating everyday life. Wrestle! is a fun story about family, dress ups and working out who you want to be in the world as well as celebrating difference. It is 1945 and the war in Europe is over and people are celebrating victory across Britain. Ruby and her mother have survived the terrifying London Blitz, with its wailing warning sirens and sweeping night lights searching for enemy bombers. Ruby’s father, who has been fighting in the war, returns home. Ruby must now adjust to this “stranger” she hardly remembers. Meanwhile, Ruby and her friends cannot resist exploring the dangerous bomb sites everywhere.When Ruby has an accident, in one of these forbidden playgrounds, daughter and father have an opportunity to learn how important they are to each other. The cartoon book tells the true story of Peter growing up in Budapest during World War II. Through the lenses of an ordinary boy, who loves playing football, we see the terror that he and his family experience as they narrowly escape being sent to their deaths.We follow Peter and his family through dangerous and desperate times, accompanied by boredom, hunger and cold. The book gently pays tribute to those Jewish children who were not so lucky to return to their home towns. Sadness is felt when Peter finds Daniel Eisler’s tin soldier collection knowing, deep down, Daniel will never return to collect them. This book, endorsed by Amnesty International UK, is a moving story of hope, courage and resilience. Peter’s story is just one among millions that led to the creation of the Universal Declaration of Human Rights adopted in 1948. This history explores the deep psychological traumas that emerged from World War II. Historian Keith Lowe describes the war as “the greatest catastrophe in human history” as Europe and Asia experienced suffering on an unimaginable scale. Keith Lowe highlights the toxic mythology that emerged from the war when the Allies were idealised as “heroes” fighting the “good war” against “monsters”.The problem with continuing this narrative is that heroes now need a new monster to fight. Nor can heroes always be perfect. Civilised Europe ceased during World War II with the onslaught of death, destruction, persecution, famine and disease. By the end of the war there were apocalyptic scenes of German cities obliterated by Allied firestorm bombing. Scenes of hell emerged when Hiroshima and Nagasaki were vaporised. Millions of Indian Bengali people died of unnecessary famine during the war due to Allied indifference. Life changed dramatically as a result. The dislocation of people led to the massive refugee movements across the globe. This included millions of European Germans who had been uprooted and exiled from their homes in the chaotic aftermath of the war. The war sowed the seeds of new freedoms but also created new fear. As soon as the war was over, people began to distrust their former Allies with the emergence of the Cold War. Having witnessed unprecedented global catastrophes, people around the world feared another bigger world war that would unleash a nuclear Armageddon. Probably the best thing about the book are the individual stories that highlight the suffering, resilience and ambiguity that so many people experienced, living through this tumultuous and devastatingly dangerous time. Not everyone will agree with everything in this book, but it certainly challenges one to think how World War II continues to shape us. — Janine Kitson, Federation Life Member. Do you like the advertisements on the inside and back cover of the book? How were the children made to feel special when the adults had parties to celebrate the end of the war? What freedoms do Ruby and her friends have? Act out different scenes of the story. Dance to music and songs that celebrate the ending of World War II. Write a story from a German child’s perspective about surviving the aerial bombing of Dresden. Student investigate ONE school-developed topic drawn from the content presented in Stage 5 overviews, ‘The Making of the Modern World’, for example The Holocaust. What do you know about the Holocaust? Why might Daniel Eisler never return to pick up his tin soldiers? How might Peter’s story be similar to other children in military conflict around the world? Make a time line of significant events affecting Jewish people in Budapest, Hungary. Make a time line of significant events affecting Jewish people in Europe. How extensive was the suffering of World War II? How did World War II change the world order? How have the traumas of World War II continued to this day? Make a timeline of key events happening from the end of World War II to the present. Choose one of the individual stories and turn it into a play. Collect current newspaper articles demonstrating the mythology of fear and freedom.